Walk with America's generals, grunts, and Green Berets through the maze of unconventional wars and unsettled peace. Four-star generals who lead the military during wartime reign like proconsuls abroad in peacetime. Secretive Green Berets trained to hunt down terrorists are assigned to seduce ruthless authoritarian regimes. Pimply young soldiers taught to seize airstrips instead play mayor, detective, and social worker in a gung-ho but ill-fated attempt to rebuild a nation after the fighting stops. 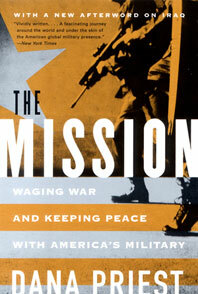 The Mission is a boots-on-the-ground account of America's growing dependence on our military to manage world affairs, describing a clash of culture and purpose through the eyes of soldiers and officers themselves. With unparalleled access to all levels of the military, Dana Priest traveled to eighteen countries—including Uzbekistan, Colombia, Kosovo, Indonesia, Nigeria, and Afghanistan—talking to generals, admirals, Special Forces A-teams, and infantry troops. Blending Ernie Pyle's worm's-eye view with David Halberstam's altitude, this book documents an historic and thought-provoking trend, one even more significant in the aftermath of September 11 as the country turns to its warriors to solve the complex international challenges ahead.